El Becerro Manso and Bajo del Charco de las Agujas are two similar dive sites into the channel between Los Corralejo and Isla de Lobos. El Becerro Manso is close to another dive called Bajo del Charco de las Agujas, but approx 300 meters further into the channel. This dive is a small reef about 3.5 meters in height, reached after five minutes gearing up at the boat. It can be used when the weather is very bad. 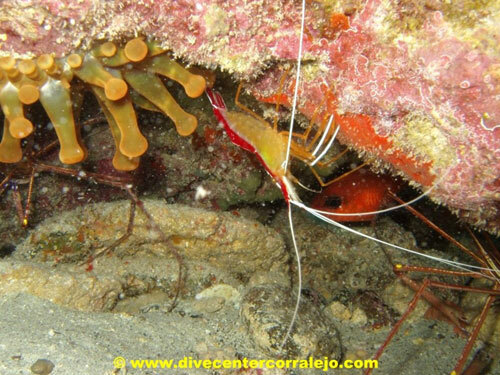 At this dive you can see many types of small fish, as well as Rays, Angel Sharks, small Guelly Jacks and Scorpion Fish. Highly recommended as a dive for both novices and experienced divers.